This post contains affiliate links. This post is part of the #Incredibles2Event press event. After you watch the Pixar short, Bao, you are going to want to make authentic steamed pork buns also known as Bao. This Bao recipe comes from the mother of the director of the Pixar short Bao. Special recipes cards were created for this recipe. Before you read about Bao, I want you to read, All your questions about Incredibles 2 answered by the directors, Behind The Scenes and Easter Eggs of Incredibles 2, It all started with No Capes!, What Will You Find In The Pixar Archives and A Look Behind The Scenes At The Pixar Campus. I want you to read all about this Incredible adventure I have been fortunate to be apart of. What is the storyline of the Pixar short, Bao? What is the translation of Bao? 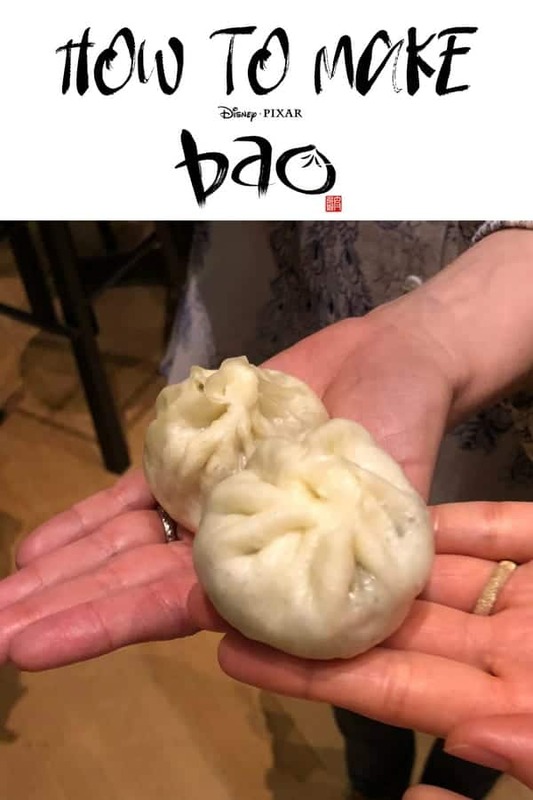 Bao can be translated to mean ‘little steamed bun’ or ‘treasure, my precious’. In the Pixar short, Bao the Chinese mother is in love with her little steamed bun and treasures the activities they do together. Did the Bao directors and animators get inspiration from for the mother? Director Domee Shi, Producer Becky Neiman-Cobb and their team took multiple trips to Chinatown, Toronto to observe the grannies of Chinatown. They took careful note and detailed sketches of their athletic shoes, bold fashion choices, large brimmed hats, the fresh produce at the markets and the groups of people practicing Thai Chi. Bao uses patterns and colors of the the clothing in the short tell the story of the mom. Happy and bright patterns and colors when she’s happy and things are good with dumpling. The patterns and colors will get darker when she’s depressed or sad. There are no straight lines in the short. Bao’s kitchen is designed to look very similar to Domee Shi’s Mom’s kitchen. Shadows are used throughout the short to show the growing divide mom and dumpling. The subway scene is a great example of the conflict and divide between the two. It took the animation team 2 months to get the folding technique animated authentically. Domee’s mom came in multiple times for lessons. Bao is a a nutritious meal in a bite sized steamed bun. Filling vary but often have pork, beef, vegetables and often ginger and oyster sauce. The white dough is hand stretched, wrapped around the filling, pinched closed at the top and steamed in a bamboo basket. When cooked the bao puff up from the steam. A lot of love and work goes into creating each bao bun. What are the Pixar Bao ingredients? Add water and kneed until a solid dough ball forms. If it get too sticky, add more flour. If it is too dry, add more water. Cover and let the dough rise for 2 hours. Cook half the ground pork in a pan, add it to the raw pork. Mix the pork with the shredded cabbage, minced carrot, green onions, beaten egg, ground ginger, olive oil, chicken bouillon powder, oyster sauce, cooking wine, salt and pepper. Cut the dough rope into 1/2″ pieces. Roll each piece into a wrapper. Spoon 1/2 a tablespoon of filling into the center of the wrapper. Carefully pinch and fold the wrapper closed, twisting the top to finish. Make sure to press the dough tight to seal the top. Bring a pot of water to boil. Place the Baos in a steaming basket lined with cabbage leaves, to prevent sticking and place the basket on top of the boiling pot of water. Turn off heat and let Baos rest for an additional 5 minutes. Enjoy warm and remember the love. Bao is the short in front of what Pixar animated film? Bao is the short in front of Incredibles 2, in Theaters June 15. Looking for Incredibles party ideas? Patty has you covered. Not in the mood for a savory Bao bun? How about a sweet one? click image to get instructions. Cut the dough rope into 1/2" pieces. Roll each piece into a wrapper. the amount of cooking wine says 2-3 cooking wine. Is that tablespoons? KB, Thanks for catching my mistake! It is 2-3 teaspoons. I have updated the recipe, thanks to you!